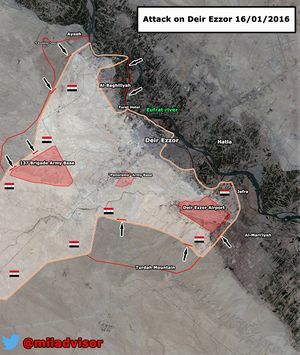 On Saturday morning in the Deir Ezzor Governorate’s northwestern countryside, the Islamic State of Iraq and Al-Sham (ISIS) launched a massive offensive to capture the Al-Bughayliyah and Ayyash Districts, striking the Syrian Arab Army’s defensive positions around the western bank of the vast Euphrates River. According to a military source from the Syrian Arab Army’s 104th Airborne Brigade of the Republican Guard, several ISIS terrorists conducted suicide operations to propel their comrades to break-through the eastern flanks of Ayyash and Al-Bughayliyah. The soldiers protecting Ayyash and Al-Bughayliyah reported finding suicide belts on several of the dead ISIS terrorists that were charging their positions near the Euphrates Hotel. Moments ago, horrific reports emerged that militants loyal to the Islamic State (ISIS) have executed hundreds of civilians in Deir Ez-Zor amidst a huge offensive to capture Al-Bughayliyah and Ayyash. Although the overall death toll is unknown for now, some 280 civilians, many whom were women and children, are believed to have been executed at point blank range allegedly due to their allegiance with the Syrian Arab Army (SAA). Among those reported dead, only 5 were captured SAA soldiers. Earlier today, some 28 government troops were also killed in clashes with ISIS at the Deir Ez-Zor districts of Ayyash, Haweeqa, and Al-Bughayliyah. Todays ISIS offensive was well-planned as tens of ISIS suicide bombers rushed across the Euphrates river by boat as to overwhelm local Syrian Army defenders. Meanwhile, other fighters attacked Ayyash from the northern flank. Upon entering the suburbs, ISIS militants summarily executed all people they could get their hands on before fleeing the area entirely. Sadly, children as young as 8 months old were executed during these horrible events. Many SAA soldiers have relatives in this area and Al-Bughayliyah has long been a Syrian Army stronghold; these facts hint to the reasons behind the attack. Islamic State jihadists have reportedly slaughtered up to 280 people in the Deir ez-Zor province, killing “whole families” for alleged cooperation with the Syrian troops. The killings are said to have taken place a day after Russian humanitarian aid was airdropped in the region. The Islamic State of Iraq and the Levant (ISIL) group has been accused of carrying out a massacre in Syrian government-held districts in the eastern city of Deir Az Zor with a monitoring group saying more than 130 people were killed. The UK-based Syrian Observatory for Human Rights said on Saturday that at least 80 of those killed were pro-government militiamen and the rest were civilians, as the armed group captured the northern suburb of al-Baghaliyeh. The Observatory added that at least 400 civilians, including families of pro-government fighters, were abducted. "There is genuine fear for their lives, there is a fear that the group might execute them as it has done before in other areas," said the Observatory's head Rami Abdurrahman. Islamic State fighters have abducted more than 400 civilians after capturing new ground in a major assault on the Syrian city of Deir ez-Zor that left dozens dead, according to reports. The British-based Syrian Observatory for Human Rights said Isis killed at least 135 people in the multi-front attack that began on Saturday. The dead included 85 civilians and 50 regime fighters, according to the human rights monitor, which said on Sunday that Isis also kidnapped more than 400 civilians from captured territory. “Those abducted, all of whom are Sunnis, include women, children and family members of pro-regime fighters,” said the director of the Observatory, Rami Abdel Rahman. He said they had been taken to areas under Isis control in the west of Deir ez-Zor province and to the border with Raqqa province – Isis’s main stronghold in Syria – to the northwest. The Islamic State militant group abducted at least 400 civilians including women and children after seizing territory in a deadly assault on Syria’s eastern city of Deir Ezzor, a monitor said on Sunday. “After their attack on Deir Ezzor (on Saturday), the militant group abducted at least 400 civilians from the residents of the Al-Baghaliyeh suburb it captured and adjacent areas in the northwest of the city,” the Syrian Observatory for Human Rights said. Earlier in the day, sources familiar with the situation told Sputnik that Daesh jihadists could enter the village with the help of some 30 suicide bombers. Local residents told Sputnik that Daesh murdered some 280 people in the Syrian province of Deir ez-Zor, where Russia had delivered a humanitarian aid earlier. While they claim total opposition to ISIS and no reason to downplay their crimes, anti-government sources had a different story of the ISIS offensive, the causes for civilian deaths at this time, and the number and type of abductions. After Islamic State fighters captured the regime-controlled neighborhood of al-Baghlia in Deir e-Zor city over the weekend, reports circulated widely in the Arabic and Western news media that they had kidnapped 400 civilians, based on information provided by the Syrian Observatory for Human Rights (SOHR). The source also claims the death toll was 100, not 300, and all but two were NDF fighters or soldiers. The activist does acknowledge civilian deaths; "IS executed two in al-Baghlia after charging them with working for the regime. There were around 15 civilians killed because of the Russian airstrikes, and the regime's shelling of the neighborhood, including 10 people from two families. Women and children were among the dead." Violations Documentation Center (VDC) currently records 26 "martyrs" in Baghaliyah Jan. 16 and 17. 4 of those are ISIS members, 3 suicide bombers and one shot in clashes. Three are FSA fighters killed "during the clashes with ISIS forces in Dudian village." One is a man who died "under torture in the regime`s prisons after being arrested for four years." Only two died by field execution by ISIS: Abbas Saleh al-Saloum and his apparent son, Wael Abbas al-Saloum. The remaining 16 victims are all civilians killed by warplane shelling: 12 men, 4 women, no children. This page was last edited on 24 January 2016, at 01:40.